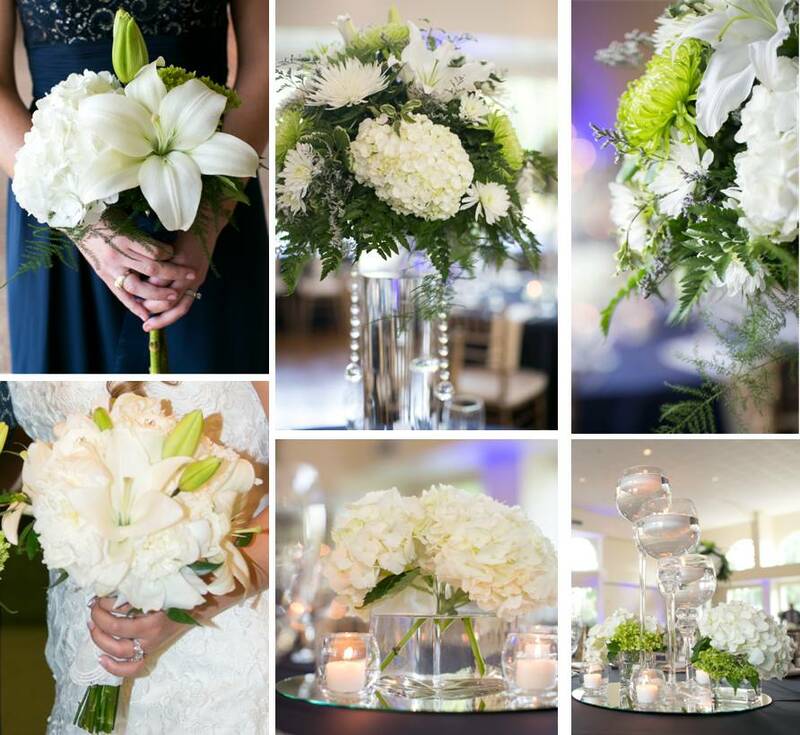 Wedding Wednesday | Sweet . Sassy . and a bit Smart-Assy . Vendors. They can make or break your Big Day. We had so many wonderful vendors that helped our big day come together perfectly! I want to give a shout out to my big ones and tell you why they are amazing in case you are looking for vendors in the Houston area. I am a firm believer in The Big Three – things you can’t cheap out on at a wedding: photography, videography, and music. Lacy with More Than an Image Photography was our photographer. Two words – Absolutely UH-mazing. She is VERY good at her job both in the talent aspect as well as customer service. Check out her blog here. Her work is awesome. Mom and I started following her back when I was in college because we loved her style of shooting so much. I knew I wanted to book our wedding with her once Joseph and I got engaged so the week after our engagement, she was my first call. You get what you pay for in vendors, especially when it comes to The Big Three I mentioned above. Lacy went above and beyond everything I expected – and to be honest, my expectations were high seeing as I had followed her on her blog for so long. With our package we got our engagement shoot, bridal shoot, and wedding day. We also got a second shooter (needed for the size of our wedding), our wedding album, releases to all of the pictures they took in High Resolution, and a print credit. With our print credit, we had Lacy design and print our Save the Dates and a canvas with one of my bridal pictures for the entry at our reception. The remaining balance was added to have more pages to our wedding album. All that would have been worth my money but we truly got a friend out of this deal. Lacy is one of those people who you meet and you feel like you have known her forever. She makes you feel like you are the only person that matters in the world when you hang out with her and it is seriously genuine. That’s not a trait that you find very often in people, especially in the wedding industry. Usually people want their money and give you the service/products that you pay for then go on with their lives. I talk to Lacy all the time still and she is just as sweet as before our wedding. 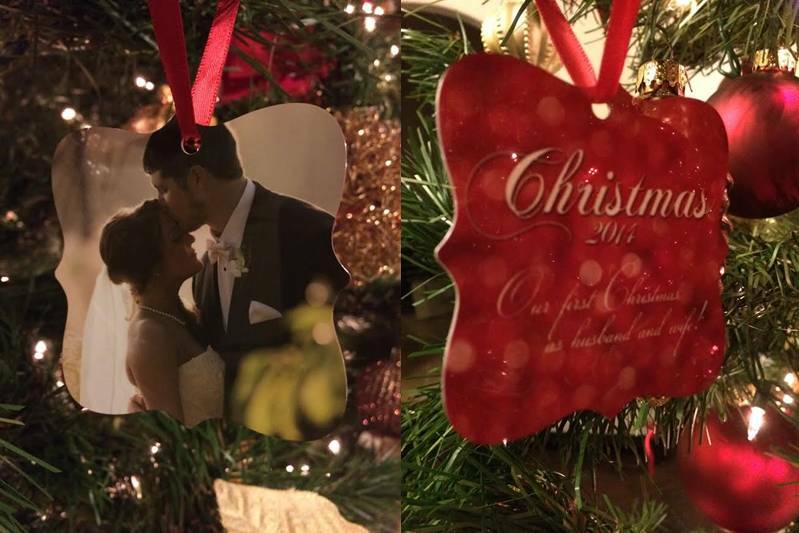 For Christmas she even mailed us an ornament with one of our wedding pictures on one side and “Our first Christmas as husband and wife” on the other side – oh, and the most delicious home-made marshmallows! Did you know you can home-make marshmallows? I didn’t but they were better than any marshmallow I have ever had AND they were shaped like snowmen! It was such a wonderful surprise and something that we will always cherish! 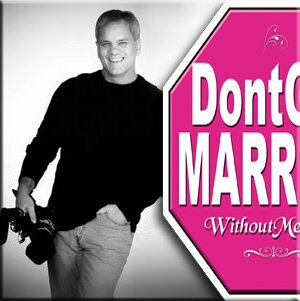 We used Rob with Don’t Get Married Without Me as our videographer. This guy is awesome and so much fun! He has nothing but 5-star reviews online (over 160 of them last time I checked) and is the most awarded videographer in Houston – and for good reason. Rob was extremely affordable (when you see all that he does) and gives you unlimited video time, meaning he will get there before your ceremony and stay until you leave the reception AT NO ADDITIONAL COST. No other videographer does that. They charge by the hour and sound super cheap at first but then you realize they only give you 3 or 4 hours of time then give you a video that is 15 minutes long with music over your entire ceremony. What’s the point of hiring a videographer if you don’t actually get to hear the vows you commit to your spouse? Our “love story” video (the overview of everything) was almost an hour long plus another video of just our entire ceremony! The “love story” covered the time while we were getting ready, our ceremony, our reception, and so much fun in between. He truly has an art of capturing footage and producing a video that can’t be beat. I loved everything he did for us so much that I volunteered to help him at the Bridal Extravaganza at the beginning of January! I think there are too many people who think they don’t need a videographer – either because they will have pictures or they don’t want to spend the extra money. You want my opinion?… (too bad you are getting it whether you want it or not because you are reading my blog). 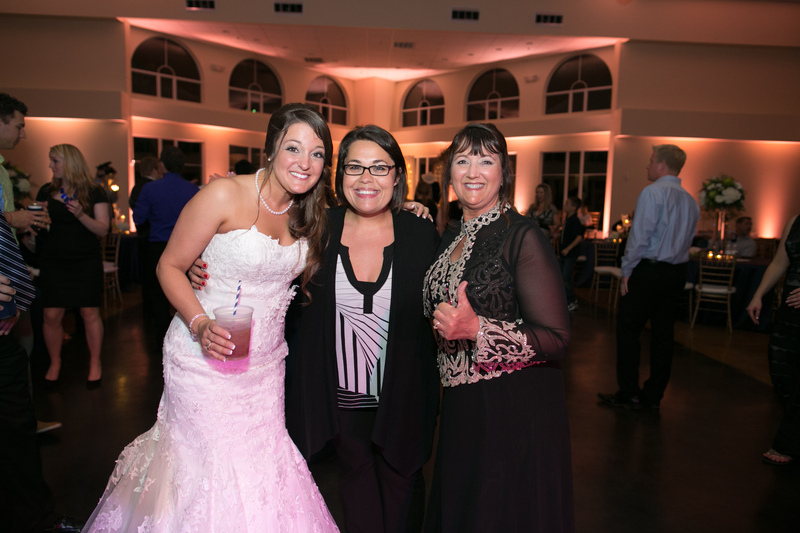 Pictures bring back the memories of your big day but videos bring back the emotions. I loved looking at all of our pictures and seeing the moments captured in time but the video helped me FEEL all of those emotions from the day of our wedding and there is honestly nothing like it. EVERYONE needs a videographer! Don’t question me. You need one. Want to see our video? Rob even created us our own website so we can share our video with people! Rob was another vendor that was super genuine. He loves what he does and his attitude and work both show it. For example, two weeks before our wedding, he called me. He didn’t call to talk about the few hundred bucks I still owed him like most vendors would be calling about. When I said, “oh I still need to pay you the remaining balance!” he said, “I am not calling about business. I am calling to see how you are doing.” WHO DOES THAT? What vendor cares like that? Another rarity in the wedding world. DJ Dave Productions was our DJ. He, like Rob, is rated number one in Houston. He has several packages but we picked the one that had his wife, Janet, be our wedding coordinator for the day. SO helpful! She made sure all of the vendors were set up and ready to go before everything started and that everything was in the proper position – exactly as we had told her. 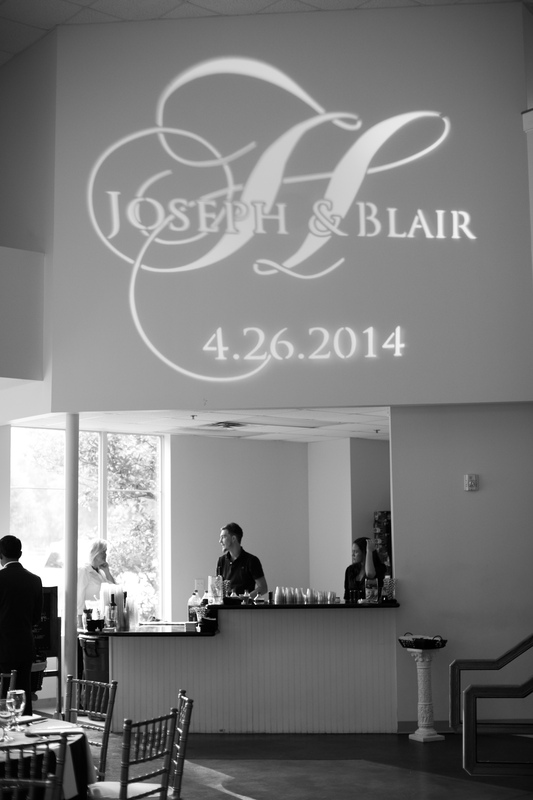 DJ Dave provided up-lighting around the reception venue, as well as fun lighting for the dance floor and a GOBO light designed just for us. He projected this on the wall of the venue above the bar all night and it looked great! We had dinner a couple of weeks before the wedding to give DJ Dave and his wife all of our information such as what we wanted to do and when and who our vendors were and how to contact them and how we wanted our reception venue set up as far as tables, dance floor, and what not. Texans BBQ catered our food and it was delicious as always. So many of our guests STILL talk about how amazing the food was. 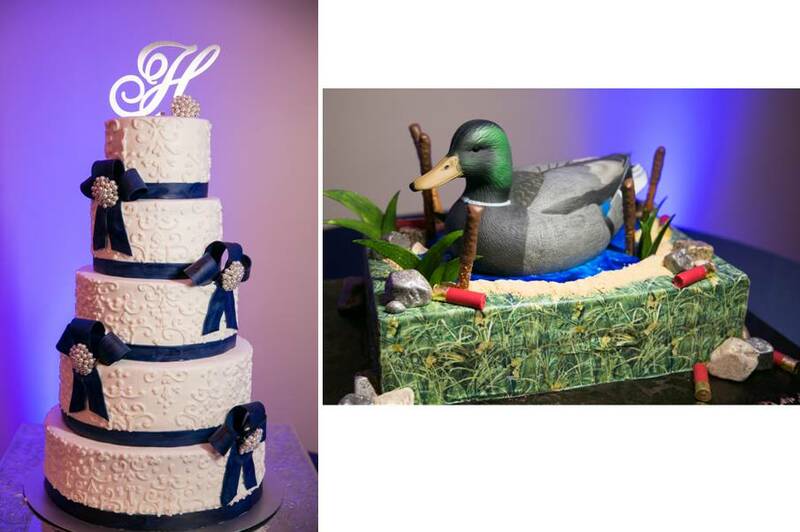 A family friend (who sadly is not doing cakes anymore) did both of these cakes. I couldn’t believe how perfect they both turned out! EXACTLY as we pictured in our heads and to top it off, they were SO tasty! Our florist was another family friend who is actually a florist at a grocery store. So for anyone questioning flowers from a grocery store, I say save some money and go for it because they turned out elegant and beautiful just like I wanted. 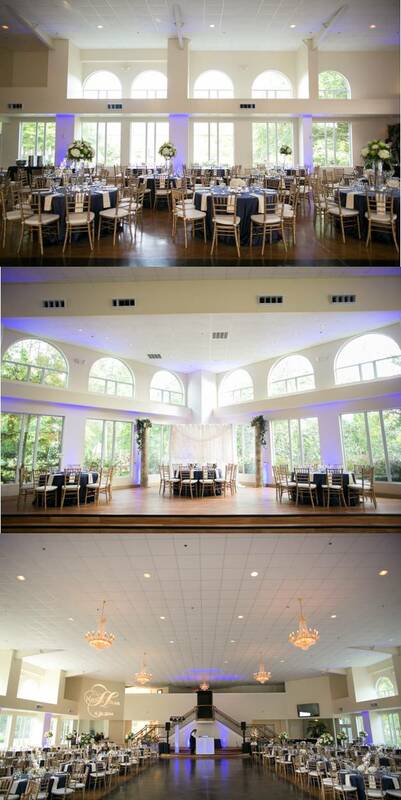 Our venue was Belle Rose Maison and it was the perfect size for what we wanted. It held over 300 people while still having a nice size dance floor. They provided the linens, plates, and silverware (at an additional price) and they let us supply the alcohol and set up how we wanted. The place was beautiful when it was all set up (because not decorated, it is nothing to shake a stick at) and I was disappointed and frustrated to say the least about the woman running the joint. She is very to-the-point and comes off very rude. A real know-it-all and argumentative throughout the planning process but the reception was beautiful and perfect and that is what matters. I will put up with crap along the way if you make sure to mind your manners and do what I ask when the Big Day comes. If you or someone you know is planning a wedding and needs advice on vendors (or anything else for that matter), let me know. My mother and I did a ridiculous amount of research to make sure we were getting the best bang for our buck! So basically we are Houston wedding gurus. If you do your research there are many vendors out there that can and will do beautiful work for far less than some of the big names. I totally agree with you on the “Big 3” vendors. you could not have selected any better. They were all great to work with. Loved the wedding video… it just got me through the last hour of work today!! 🙂 Such a fun and beautiful wedding! Love you! Thanks Britt! Love you too!